Join Wendy on Thursday, October 11, 18 & 25 from 12-2. $85 plus materials. The perfect solution to the cooling Fall evenings. 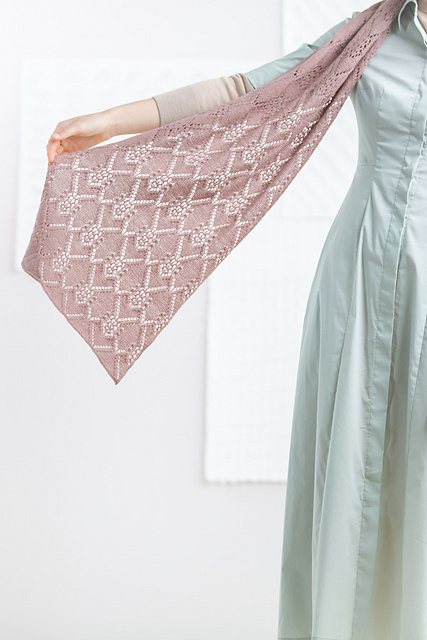 Dotted with a symmetrical arrangement of eyelets and lace, the Kenchiku Wrap is delicate while demonstrating a strong pattern. This lace stole is worked flat in two pieces, each from the cast-on edge to the interior; the pieces are then joined at the center. The sky’s the limit in terms of weight (lace weight is lovely, but this also works as a slightly heavier piece) and color. The allover lace motif may be worked either from a chart or from written instructions.